Premium Red Hound Auto heavy duty dual ball bearing vehicle dolly set, designed tough and made from the highest quality materials. 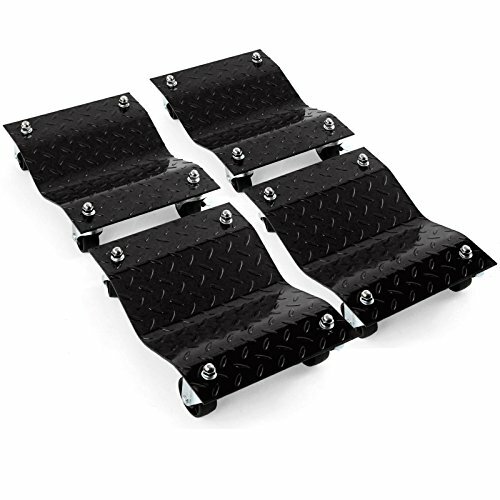 Made from solid diamond plate steel with a protective black powder coat finish. Please note these are high end dollies, designed for easy operation! Wheels have a dual ball bearing swivel design and smooth rolling radial ball bearing axles that provide easy, multi-directional movement when loaded. Compared to the huge resistance you'll get moving with a common single bearing dolly, our premium bearing axles will let you roll with much less force. Great for shops, garages and showrooms, these dollies let you easily move cars, trucks, trailers, boats, tractors, ATVs, motorcycles, airplanes and more! Each dolly, measuring approximately 12" x 16", is rated for 1,500 lbs. and includes a convenient handle. Total capacity 6,000 pounds for all 4. Best of all, the product is backed by a one year guarantee against workmanship and defects. If you have any questions about this product by Red Hound Auto, contact us by completing and submitting the form below. If you are looking for a specif part number, please include it with your message.